You were the winner of the ESV Illuminated Bible giveaway. Thanks to all who entered. Whew! I’ve been MIA for too long from this space. Here are a few things that have been going on in my life to kind of get you up to date. Seahawk turned 14 almost a month ago. 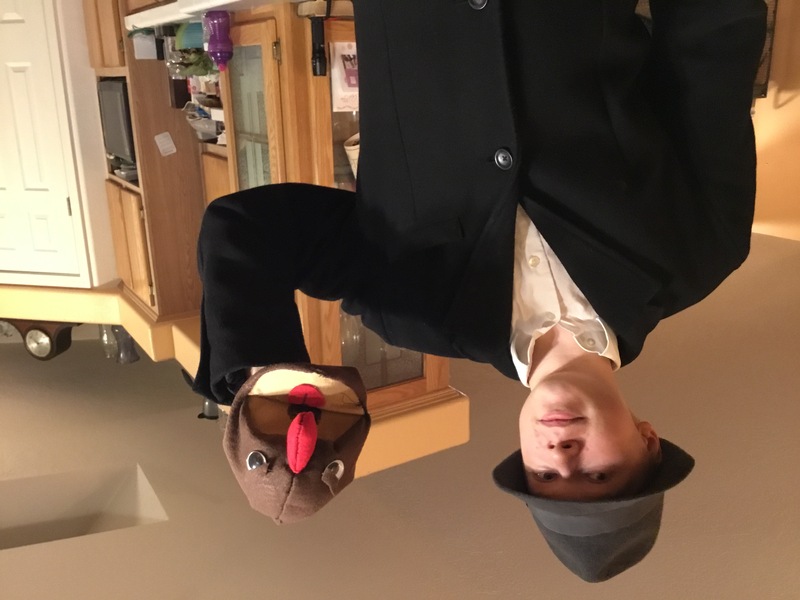 He’s growing up into such a fine young man, and I’m really proud of him. Three weeks later, Dragonfly turned 2. He’s such a little doll, and we all love him loads. He’s definitely a joyful child – and all boy! For his birthday present, Will and I got him a foam sword and shield with yellow decorations on them (his favorite color is “lellow”), and he’s been spending the past couple of weeks clobbering his brothers, especially Small Fry, who has a matching sword and shield set (in blue). The big boys are participating in the local performance of The Nutcracker again this year. Hopefully I won’t neglect to write about it like I did last year. I’m super excited to see their performance – they’ve been rehearsing 2-3 times a week for about a month now. Last January, Will took the plunge to start his own newspaper for his comic strip. It took a lot of work to get the first issue up off the ground (between finding advertisers with no sample to show them and figuring out where to circulate), and his first issue was passed out to every elementary and middle school (public school) student in our hometown last spring. The second issue followed up before school let out for the summer, and now that school is back in session, he’s released the third issue to schools. He’s busily working on the layout and artwork for the fourth issue, set to come out sometime in December, before the schools break for Christmas. In addition to creating the content for the paper, he’s working hard to sell more ad space and pick up additional schools for distribution. It’s a lot for just one guy to do, but he’s working it and doing a fabulous job. If you know a school district that might be interested in carrying the paper, contact my husband at paper@caseyandkyle.com. 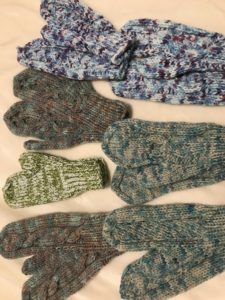 I knit two adult sized sweaters for Christmas – one for my mom and one for my stepdad. I can’t wait to give them to them next month! 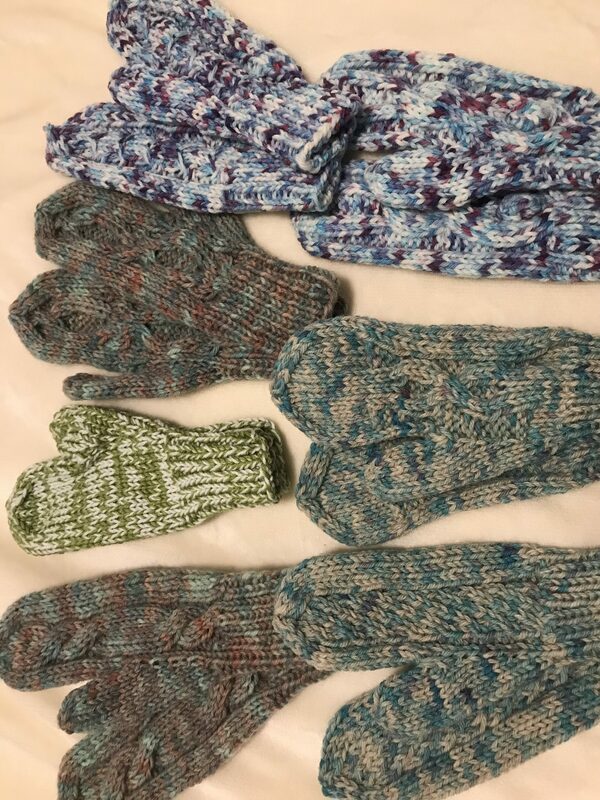 In addition to the sweaters (which take about a month to do one that big), I also knit 7 pairs of mittens to give to my nieces and nephews for Christmas. I’m really glad to have all of my Christmas gifts prepped and ready before Thanksgiving (except for what we get for our own kids, that is). 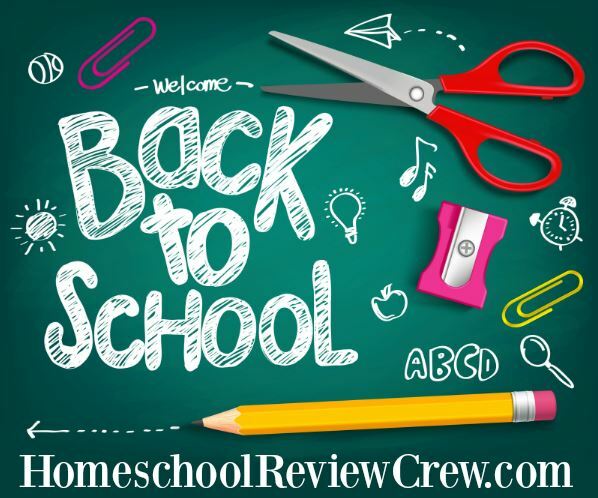 The month of September found us floundering a bit in our homeschool, so I found something new for us to do curriculum-wise, and that is the Easy Peasy, All in One Homeschool. We’ve been working hard on that each day since October, and I’m much happier with what the boys are learning now. It’s nice to have a schedule so I don’t have to worry about “are they doing enough?” Following this schedule, I just know that they are doing enough. Thanks to Finch N Wren! My friend Wren, half of the blog Finch n Wren, has been doing a fun series all summer long: 5 Things You Didn’t Know About… where she sent interview questions out to some of her favorite bloggers. This was an easy way for her to keep her blog active while she dealt with some health issues, and I was more than happy to participate. Head over to their blog and check out my interview! Small Fry has long been a fan of standing on the back of the shopping cart. Now that Dragonfly is “big” too, he’s joining those ranks. I don’t let them do this when it’s me and the kids, but Will was with us this day, and he’s a lot more fun than I am (lol). 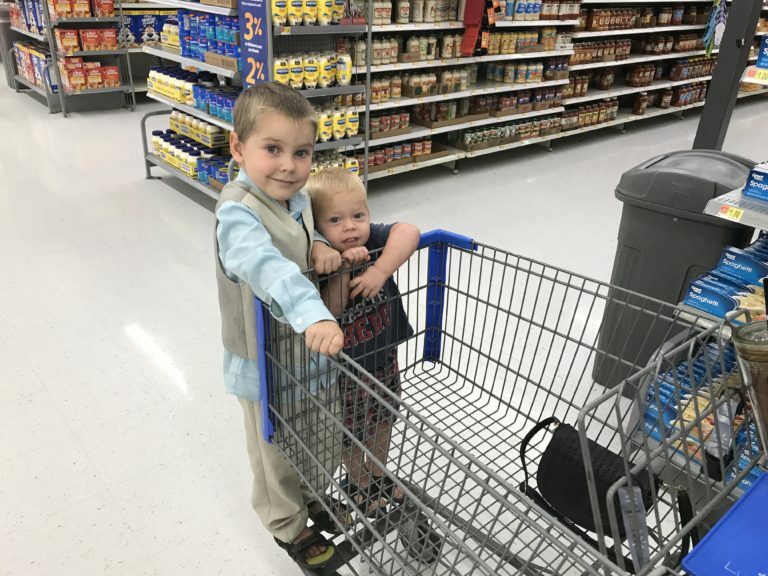 So they had a great time riding on the outside of the basket for a few minutes while we were walking through the store. I wrote recently about all the neat cakes at the state fair this year. Now I want to go over the other stuff we saw there. First up, these buttons. When Will was there four days earlier (he was a featured speaker on Author Day), he got to meet the woman who made them. Apparently she was there one of the days creating new buttons for spectators to see. That would have been neat, but we weren’t able to make it back that day. 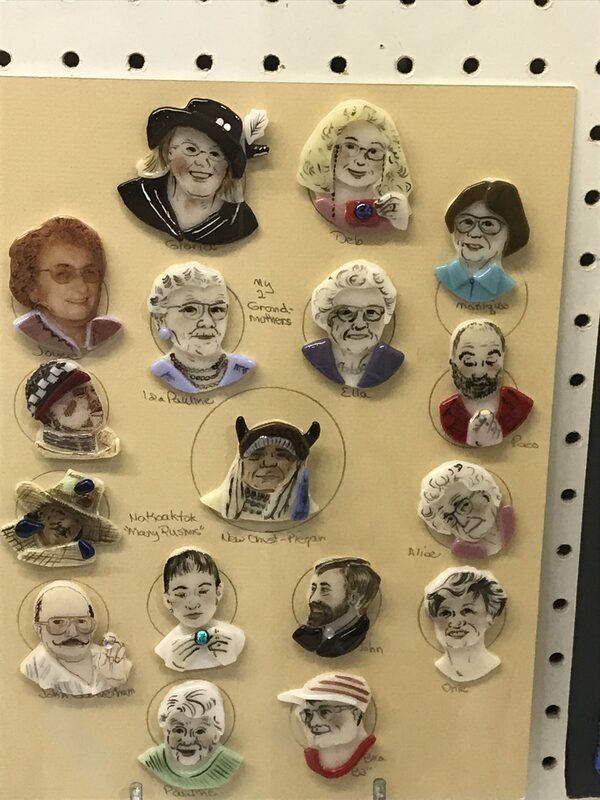 Even so, seeing the buttons she had made was pretty cool. Her work is sublime. I’m especially impressed by the ones with people on them. The tag said that they were all inspired by her grandparents. 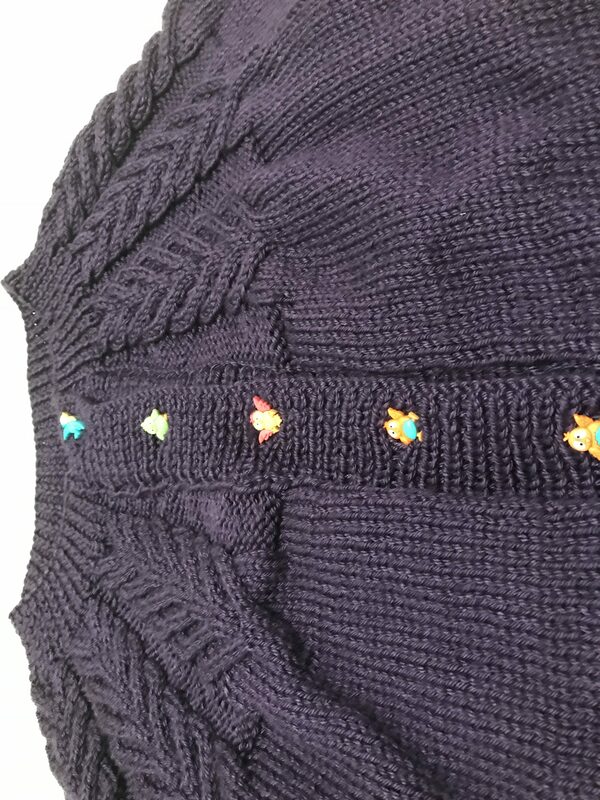 Near the buttons were all the knitted and crocheted entries. Lots of neat stuff there! 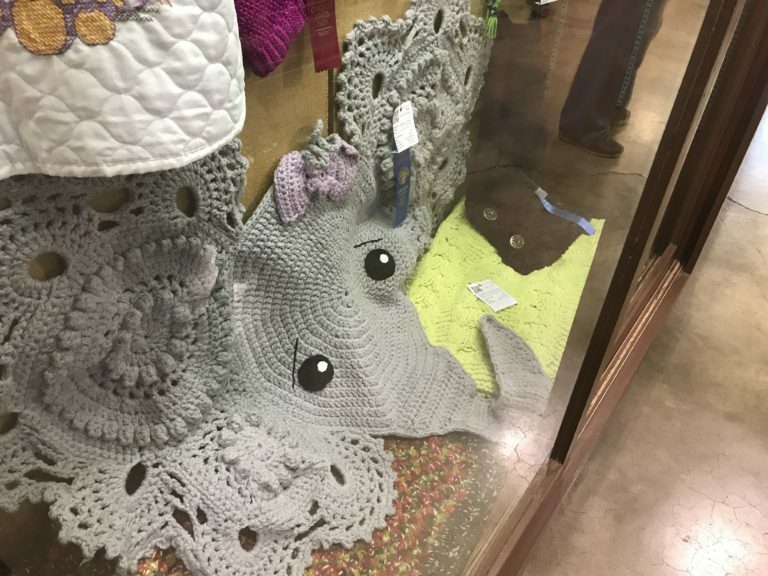 Even though I don’t normally crochet anymore, or even really like the look of it that much (I vastly prefer knitting), my very favorite entry was this crocheted elephant rug. 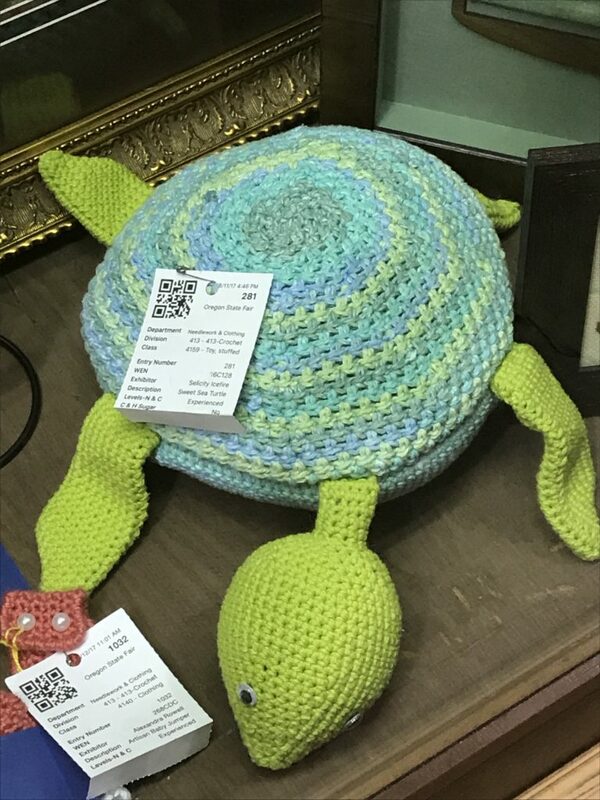 Munchkin’s favorite was this crocheted turtle. Next up was the quilts. There were so many to see! It was almost as intense as the Quilt Expo we went to a few years back. 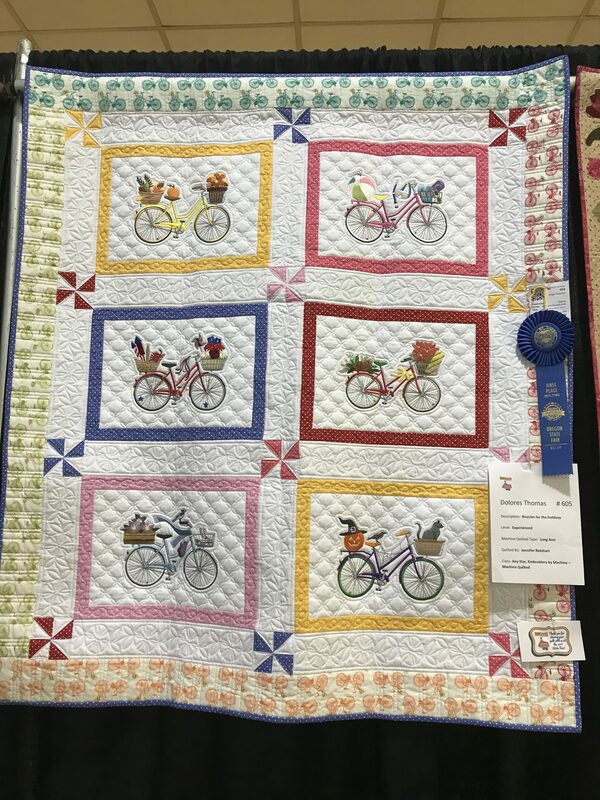 My favorite one was this bicycle quilt. 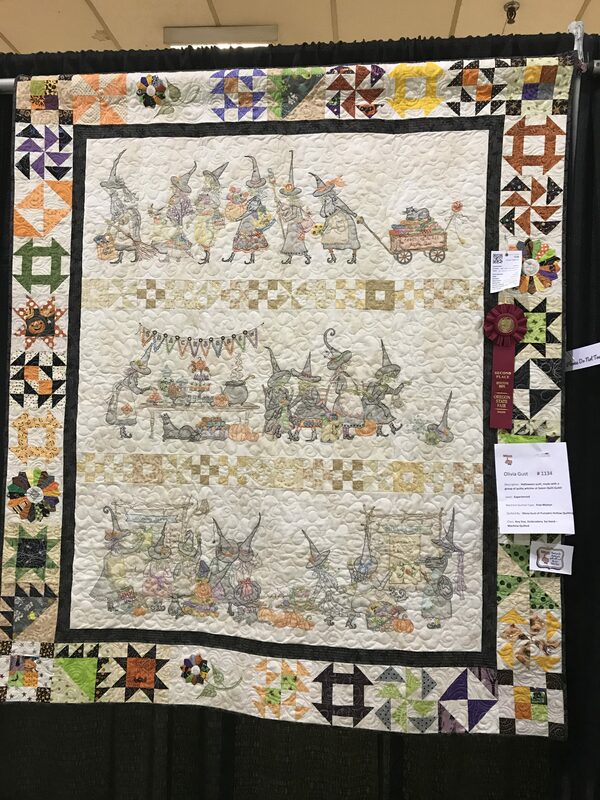 This Halloween themed quilt caught my eye because not only is it beautifully crafted, but I recognized the name of the artist! She used to go to our church, and she made a quilt for Small Fry for my baby shower two weeks before he was born. The main thing we did besides the artists room was the animals. 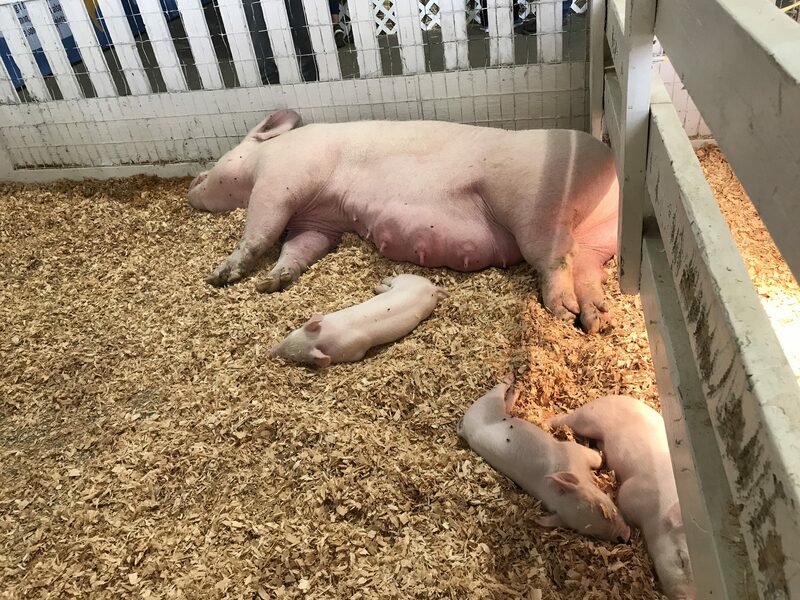 We saw all sorts of animals, but everyone’s favorites were the cows and pigs. Here are some of our favorite pictures of those. 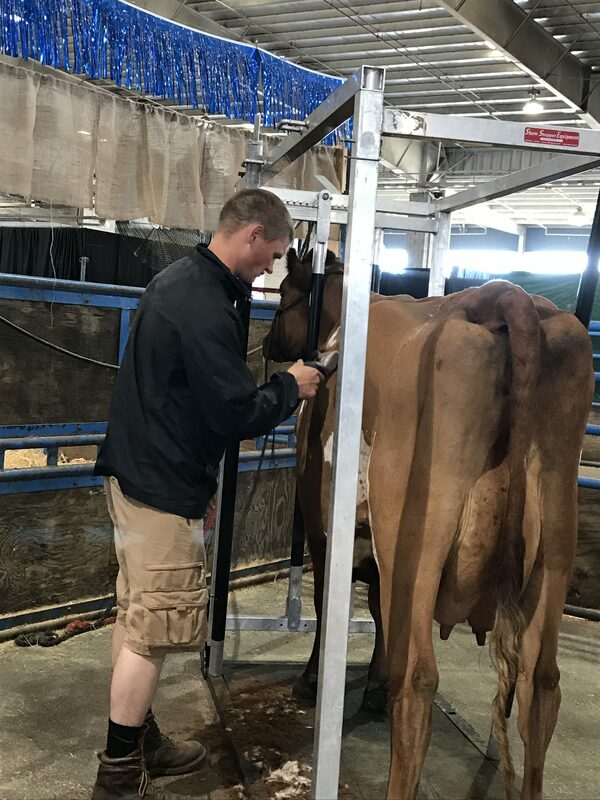 You don’t normally think of cows as needing “haircuts,” but apparently they do! And that was basically our time at the Fair! Generally speaking, Munchkin is the quietest of all four boys. His preferred activity is reading 90% of the time. He read his first novel, Charlotte’s Web, when he was just 6 years old. (I mentioned that briefly just a couple of days ago in a post.) He’s a very hard worker, and he always wants to please the grownups around him. It’s this desire to please that allows him to bond with adults better than he does with kids most of the time (just like me when I was his age). 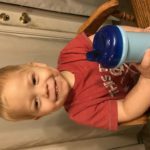 He is a blessing to us, and I’m so glad I get to be his mom. We started our official homeschool year this week. Seahawk is in 8th grade now, Munchkin is in 6th, and Small Fry is in Kindergarten (I suppose that might mean I’ll have to change his blog nickname soon since he’s not really that small anymore…). 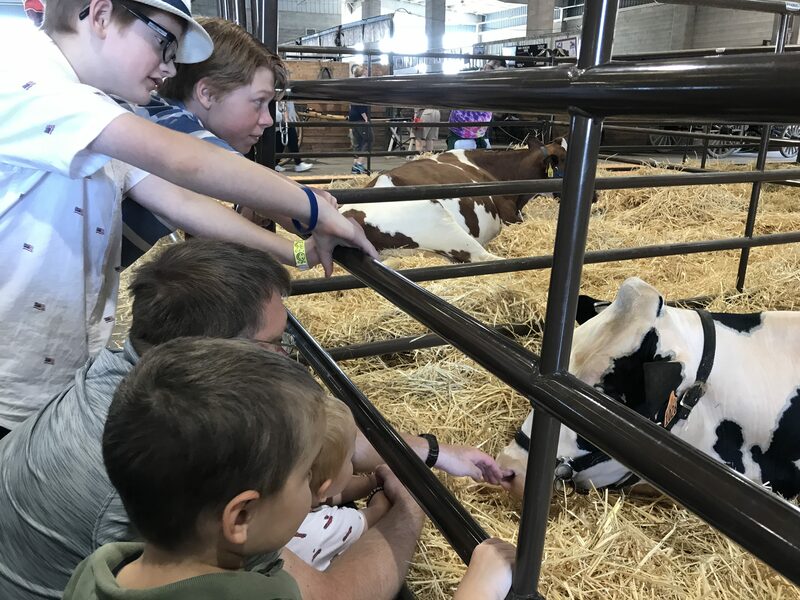 I’ll give each of these boys a special day here on the blog to talk about their favorite things and what we’re planning to use for their curriculum this year. Today, I’m starting with my brand-new Kindergartner. I told him he could decorate this sign any way he liked. He chose to fill the K with stars, and then he drew a fan near the bottom because “I like to make fans.” He drew a picture of an envelope next to the fan because he “likes to mail things.” Then he filled the rest of the area with random letters because he loves to write, even though he’s not proficient enough to write anything but his name yet. Speaking of his name, he wrote that on his paper too, but I marked that out for privacy reasons. That’s what the green box on the left is. Oh, and that’s not a black eye he has. He just likes to use my eyeliner to get pirate eyepatches sometimes. Small Fry is 5 years old. His birthday is right near Will’s and mine (all three of us are in a 9-day period in July), so that’s pretty special. His favorite foods are spaghetti, macaroni and cheese, pizza, pickles, blueberries, and ramen (a newfound love). He started learning to read about six months ago, and we’re really going to be cracking down on that skill over the next few months. 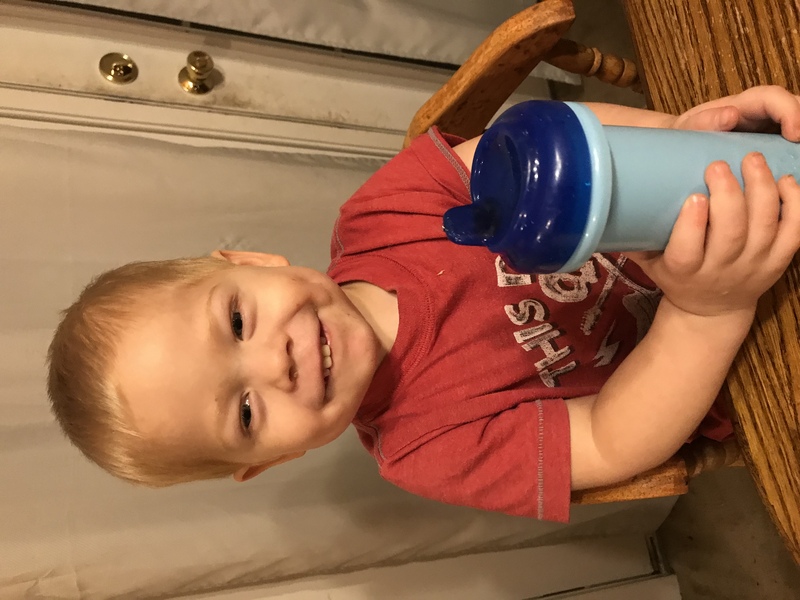 He also loves to watch movies (just like his dad) and play outside with his big brothers and their friends. Reading: We will finish up the Eclectic Foundations curriculum we reviewed a few months ago. When that’s done, I think I’ll just have him practice his reading using easy readers from the library. Math: We’re using Starfall Kindergarten Mathematics with him. Even though it was designed to be used in a classroom setting, I’m really impressed with it and have been modifying it to work with just one student. So far, it’s a hit with Small Fry. French: He got his very own Rosetta Stone account on my computer this week (we have the full program, which allows up to 5 students and were only using 4 before now). On the first day, he made it through half a lesson. Considering that first lesson is quite involved, I’m impressed that he made it that far – and was doing quite well with it. Geography: We are currently reviewing Let’s Go Geography, a curriculum for kids in grades K-4. I’ll have that review up here on the blog in about two weeks. That’s it. 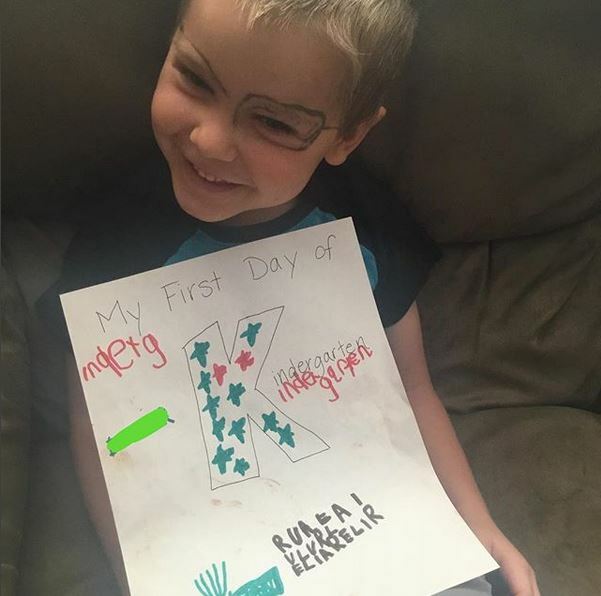 Like I said, I want his Kindergarten year to be full of meaningful education, but I don’t want him to get burned out on school, so we’re keeping it very basic until more is absolutely needed. I love creating lap books with my children. I think they’re such a neat way to showcase the things a child has learned, but they can sometimes be cumbersome to try to figure out how to fill if you’re working from scratch. This is where companies like A Journey Through Learning Lapbooks come in. 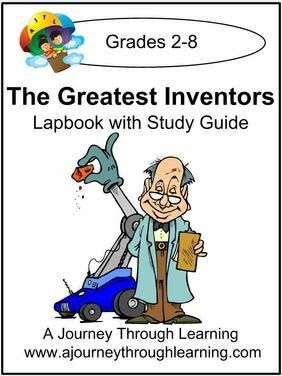 For this review, Munchkin and I worked on their lapbook entitled The Greatest Inventors. 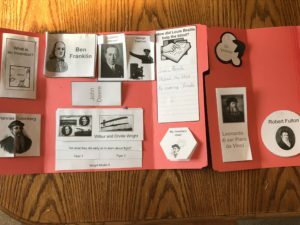 In addition to studying all of these great inventors, there are mini books for students to explore what an invention is, their favorite invention and inventor of the study, and to create their own invention. Once the pages were printed, doing the actual study was quite simple. I would have Munchkin read the information page on the inventor and then work through the instructions on the mini book for that inventor. It was usually just answering a couple of questions about the inventor and folding or cutting/gluing the elements together and then pasting them into the file folder. To keep this study light, easy, and fun for summertime, I had Munchkin work on about 2 inventors per week. At this pace, he’ll finish up in about two more weeks from now. 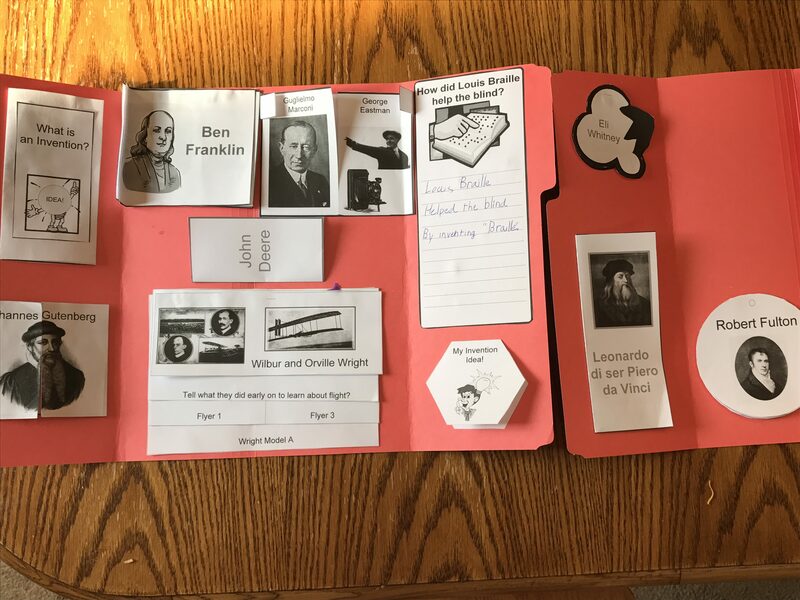 If we’d been working during the school year, I imagine the pace would have been comparable, but we would have been a lot more intense in our studies; I would have had him learn more about each inventor than just what was included in the information page in the lapbook study itself. It’s been a long time since we’ve done a lapbook in our homeschool, and doing this review has reminded me just how much I love them. I didn’t learn about lapbooks until the older kids were in upper elementary school, and they (especially Seahawk, who’s going into 8th grade now) already seemed like they were “too old” at that time. Due to this review, Munchkin now realizes that lapbooks are not only a great way to record your learning, but also a lot of fun to build. I specifically asked him if he liked this one, and I was pleasantly surprised when he said that he did. My last memory of lapbooking with either of the older kids was that they didn’t really enjoy it, which is why we haven’t done it. I’m thrilled that he’s become open minded to the prospect of them again. I also have the blessing of a second “set” of children with whom I can introduce to lapbooking at a young enough age that they’ll appreciate it. Even though this particular lapbook is geared toward grades 2-8, I’m thinking I might do it this school year with Small Fry (Kindergarten) in a more simplified manner. By having me read to him and then having him dictate the answers to fill in the mini books – or even have him answer them in pictures instead of words – I think this could totally work for him. Overall, even though I was unsure about requesting this review when the opportunity first arose, I’m really glad we got this opportunity. It reminded me just how much I enjoy lapbooks and that I want to start bringing them back to our homeschool. A Journey Through Learning Lapbooks has tons of lapbooks to choose from. They even have several to go along with outside curriculum, including Apologia and Answers in Genesis. You can choose individual lapbooks for around $8 or bundles, which include between 4 and 7 lapbooks (I didn’t look at all of them, but I looked at a wide variety of the bundles and that’s the range I saw). These bundles range in price from $30 to $45 depending on how many they include. If you want several lapbooks on a single (but wide, such as “natural disasters”) topic, the bundle is definitely the way to go. Members of the Homeschool Review Crew are reviewing a variety of lapbooks from A Journey Through Learning this week. Click the banner below for more information. 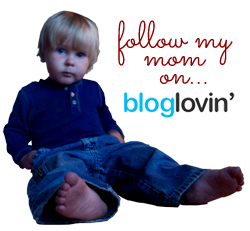 The Homeschool Review Crew spent last week doing a blog hop all about getting back to school. I really should have participated, but I wasn’t at a place to be ready for “back to school” yet, so I sat out. But I want anyone who reads here to have the opportunity to read those posts, so I’m going to link back to them from here. I hope some (or all) of them are a blessing to you! I recently reviewed a Pre-Algebra program with Seahawk, and he’s done really well with it. 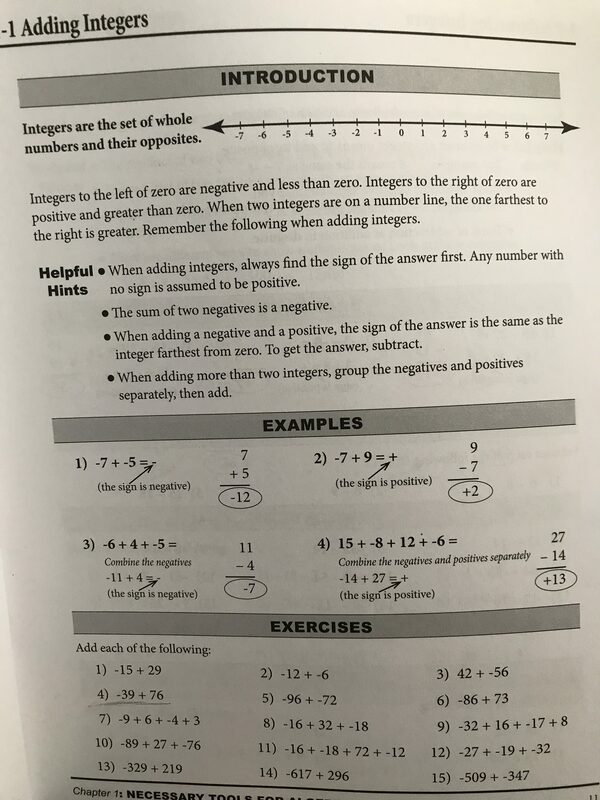 When the opportunity to review No-Nonsense Algebra from Math Essentials presented itself, I thought the early chapters would make a good supplement to his current pre-algebra course, and then when he finished that, we’d have the Algebra 1 program set aside ready to dive into. 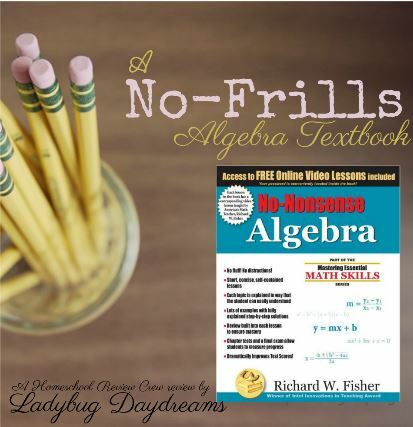 No-Nonsense Algebra is a softcover math textbook, and as its title suggests, it is just Algebra. There are absolutely no frills, lessons are short and self-contained, and there are loads of examples and practice problems. And to make a good textbook even better, author Richard W. Fisher has created video instruction to go with every single lesson in the book. The access passcode is printed right in the book (on the first title page), so you don’t have to ever worry about losing it. The very first lesson. Note that there’s nothing on the page except the actual information needed and practice problems. That’s what I mean by “no frills.” Click to enlarge. As I mentioned before, Seahawk was the main beneficiary of this math book. He wasn’t thrilled with this (he really likes his online math program), but after the very first lesson he was a convert. He was having trouble wrapping his mind around adding and subtracting negative numbers, and Mr. Fisher’s video lesson explained it much more clearly than anything we’d come across previously. After that one video lesson, Seahawk was able to do all of the practice problems (15 of them) in record time. From then on, doing this book in conjunction with his regular math lesson has been just fine – which is a real testament to the effectiveness of this program, considering it’s summertime and my energetic 13-year-old would rather be spending time outside with his friends. 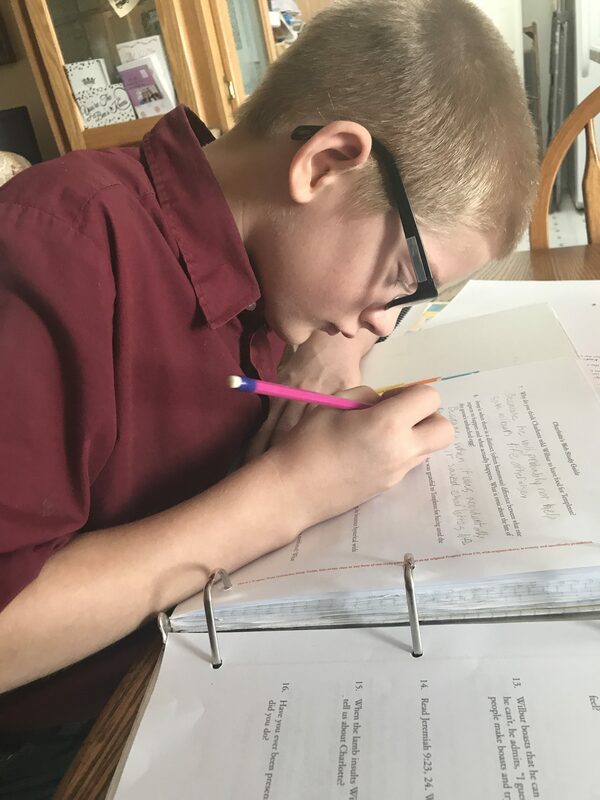 In addition to doing this with Seahawk, I decided to have Munchkin (almost 11, going into 6th grade) sit in on the first lesson, just to see how he did with it. While I won’t say that was a complete failure, it was definitely clear after just a few minutes that it was way beyond him. He got very frustrated, so I quickly let him off the hook and continued on with just Seahawk. 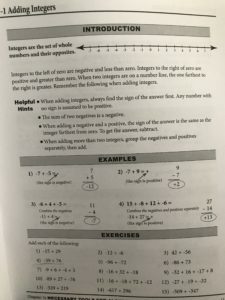 However… we’ve had such great success with the older son that I’m seriously considering getting the Math Essentials Middle School book for him to use this school year. One of my favorite things about this text is that it provides constant review for the student. I think this is absolutely vital in helping them to remember what they’ve learned. Without frequent review of the material, it’s too easy to “learn the test,” and that’s not what we want for our students. We want them to actually know what they’re learning so they have the skills they need to succeed long-term. And while not every algebraic concept is useful in the “real world” (I don’t even remember the last time I needed the quadratic equation was – probably when I was taking high school math classes! ), many of them are. For this reason, I’m so glad to have the opportunity to use such a solid math book with my boys. And because this is a textbook as opposed to a workbook, I’ll have it on hand for all of them. I’m really glad about that! 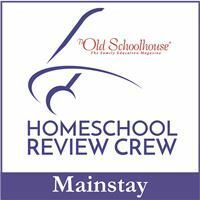 There are 60 reviews on No-Nonsense Algebra from members of the Homeschool Review Crew this week. Make sure to click the banner below to find links to the rest of them.